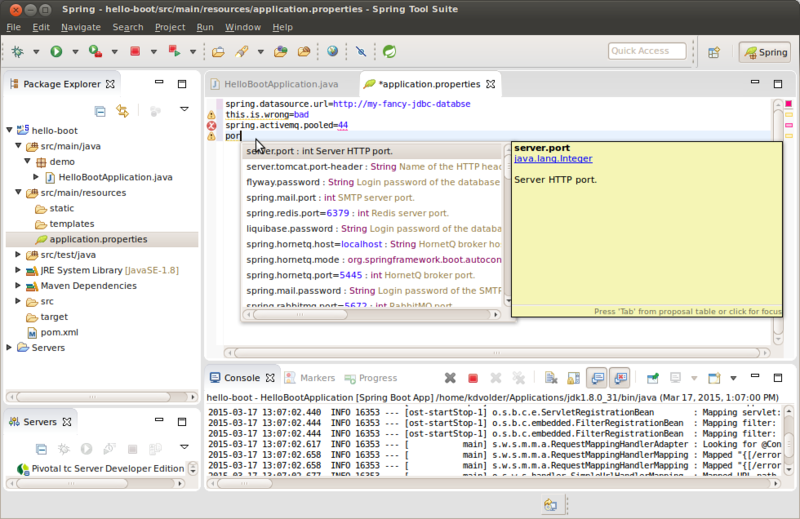 Spring Tool Suite 3.6.4 was just released last week. 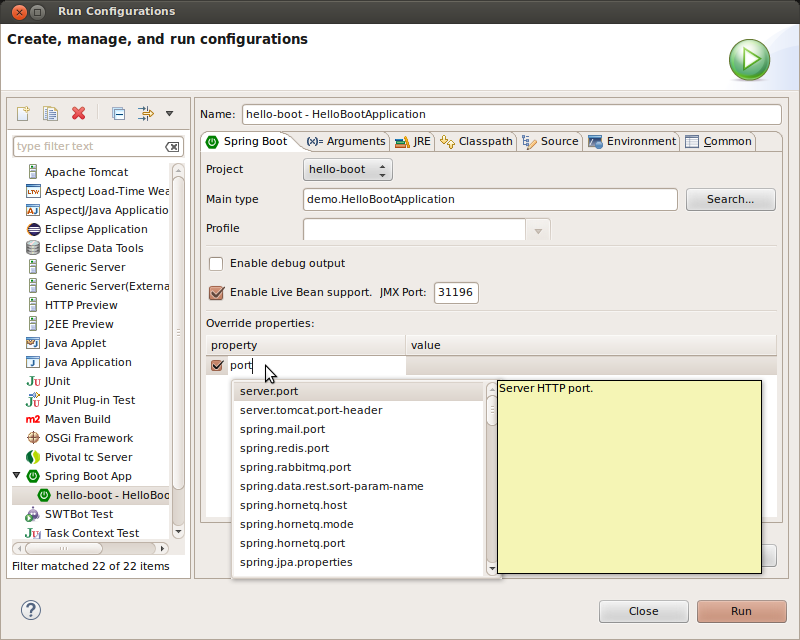 This blog post is a tutorial demonstrating some of the new features STS provides to create and work with Spring Boot applications. use the new STS Properties editor to edit configuration properties. use @ConfigurationProperties in your code to get the same editor support for your own configuration properties. 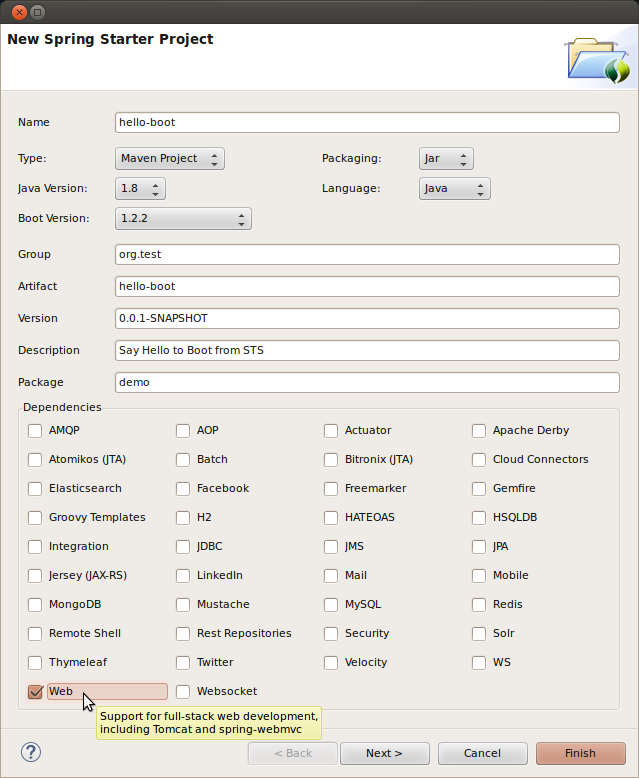 We use the “New Spring Starter” wizard to create a basic spring boot app. Spring boot provides so called ‘starters’. A starter is set of classpath dependencies, which, together with Spring Boot auto configuration lets you get started with an app without needing to do any configuration. We pick the ‘web’ starter as we’ll build a simple ‘Hello’ rest service. The wizard is a GUI frontend that, under the hood, uses the web service at start.spring.io to generate some basic scaffolding. You could use the web service directly yourself, download the zip it generates, unpack it, import it etc. Using the STS wizard does all of this at the click of a button and ensures the project is configured correctly so you can immediately start coding. 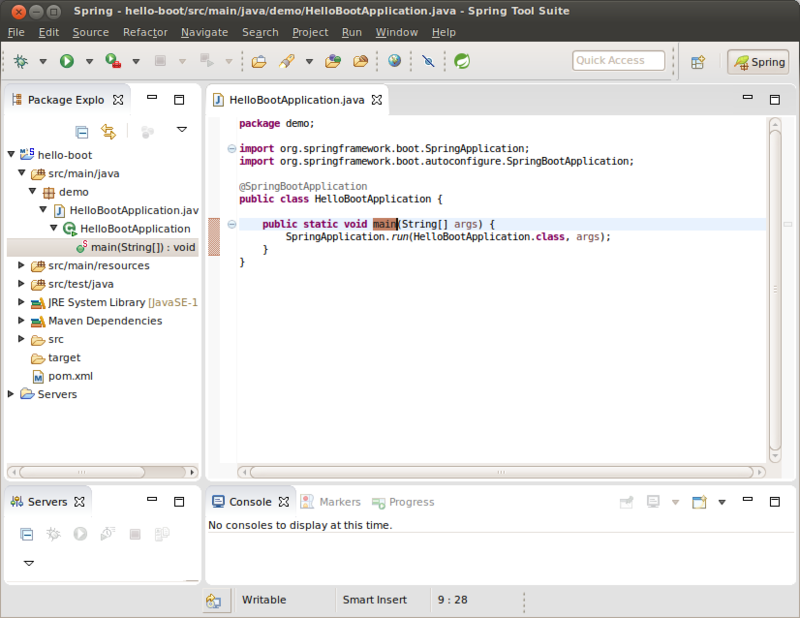 The HelloBootApplication Java-main class generated by start.spring.io is the only code in our app at the moment. Thanks to the ‘magic’ of spring boot, and because we added the ‘web’ starter to our dependencies, this tiny piece of code is already a fully functional web server! It just doesn’t have any real content yet. Before adding some content, let’s learn how to run the app, and verify it actually runs in the process. the Cloud Foundry platform directly supports deploying standalone Java apps. Note: We won’t cover how to deploy apps to Cloud Foundry here, but in this article you can learm more about using Cloud Foundry Eclipse to do that directly from your IDE. Now, if you understood what I just said, then you probably realize you don’t actually need any ‘special’ tooling from STS to run the app locally. Just click on the Java Main type and select “Run As >> Java Application” and voila. Also all of your standard Eclipse Java debugging tools will ‘just work’. However, STS provides a dedicated launcher that does basically the same thing but adds a few useful bells and whistles. So let’s use that instead. You can open your app running locally at http://localhost:8080. All you’ll get is a 404 error page, but that is exactly as expected since we haven’t yet added any real content to our app. Select server.port add the value 8888 in the right column and click “Run”. This may be a bit of a surprise, since we just changed our port didn’t we? Actually the port conflict here is not from the http port but a JMX port used to enable “Live Bean Graph Support” (I won’t discuss this feature in this Blog post, see STS 3.6.4 release notes). Overriding default property values from the Launch Configuration editor is convenient for a ‘quick override’, but it probably isn’t a great idea to rely on this to configure many properties and manage more complex configurations for the longer term. For this it is better to manage properties in a properties file which you can commit to SCM. The starter Wizard already conveniently created an empty application.properties for us. The above screen shot shows a bit of ‘messing around’ with the content assist and error checking. The only property shown that’s really meaningful for our very simple ‘error page App’ right now is server.port. Try changing the port in the properties file and it should be picked up automatically when you run the app again. However be mindful that properties overridden in the Launch Configuration take priority over application.properties. So you’ll have to uncheck or delete the server.port property in the Launch Configuration to see the effect. Create a ‘Hello’ rest service that returns a ‘greeting’ message. 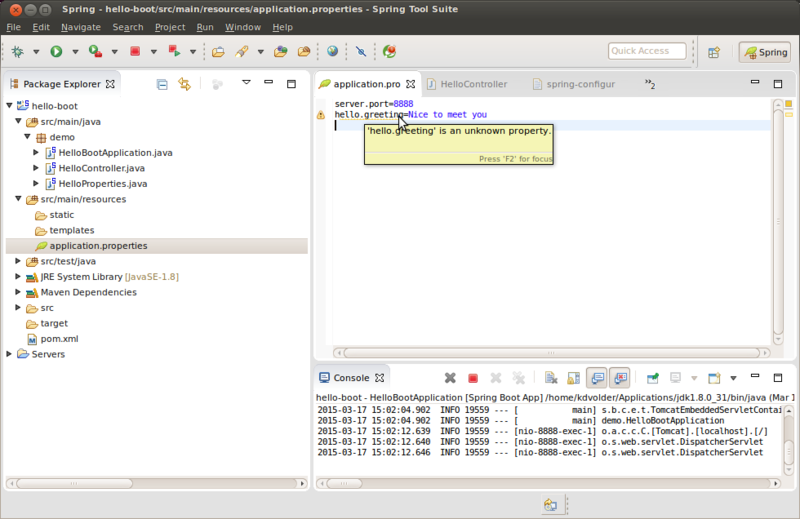 Make the greeting message configurable via Spring properties. Set up the project so user-defined properties get nice editor support. To create the rest service you could follow this guide. Hover we’re doing something even simpler and more direct. Try this out by Relaunching ( ) your app. The URL http://localhost:8888/hello?name=Kris should return a text message “Hello Kris”. This is actually quite easy to do, and you might be familiar with Spring’s @Value annotation. However, using @Value you won’t be able get nice content assist. Spring Properties Editor won’t be aware of properties you define that way. To understand why, it is useful to understand a little bit about how the Spring Properties Editor gets its information about the known properties. Some of the Spring Boot Jars starting from version 1.2.x contain special JSON meta-data files that the editor looks for on your project’s classpath and parses. These files contain information about the known configuration properties. If you dig for a little, you can find these files from STS. 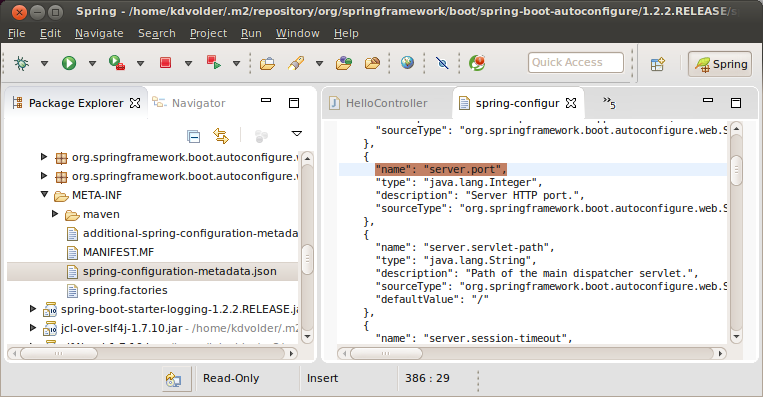 For example, open “spring-boot-autoconfigure-1.2.2.RELEASE.jar” (under “Maven Dependencies”) and browse to “META-INF/spring-configuration-metadata.json”. You’ll find properties like server.port being documented there. * Greeting message returned by the Hello Rest service. The @ConfigurationProperties("hello") tells Boot to take configuration properties starting with hello. and try to inject them into corresponding Bean properties of the HelloProperties Bean. The @Component annotation marks this class so that Spring Boot will pick up on it scanning the classpath and turn it into a Bean. Thus, if a configuration file (or another property source) contains a property hello.greeting then the value of that property will be injected into setGreeting of our HelloProperties Bean. Relaunch your app again and try to access http://localhost:8888/hello?name=yourname. You should get the default “Welcome yourname” message. What’s still missing to make the editor aware is the spring-configuration-metadata.json file. This file is created at build-time by the spring-boot-configuration-processor which is a Java Annotation Processor. We have to add this processor to our project and make sure it is executed during project builds. Note: We know that the manual step of adding the processor seems like an unnecessary complication. We have plans to automate this further in the future. I hope you enjoyed this Tutorial. Comments and questions are welcome. In another post, coming soon, I will show you more adanced uses of @ConfigurationProperties and how the STS properties editor supports that.